The aim of this study was to assess the genetic variation and population structure of the geophyte Leucojum aestivum L. across the Po river valley (N-Italy), to inform conservation management actions with the selection of most suitable source populations for translocation purposes. L. aestivum is self-incompatible and occurs in S-Europe in fragmented wetlands and lowland forests along rivers. The species is particularly interesting for habitat restoration practices for its simplicity of ex situ conservation and cultivation. AFLP analyses were carried out on 16 fragmented populations, using four primer combinations. Correlations between genetic variation and demographic and ecological traits were tested. AFLP produced a total of 202 bands, 95.5% of which were polymorphic. Our results suggest that L. aestivum holds low to moderate levels of genetic diversity (mean Nei’s genetic diversity: H = 0.125), mostly within-population. We found a gradient of two main biogeographic groups along western and eastern populations, while the STRUCTURE analysis found that the most likely number of clusters was K = 3, shaping a partially consistent pattern. We explain the unusual negative correlation between genetic variation and population size with the high rate of vegetative reproduction. The levels of population differentiation suggest that fragmentation in L. aestivum populations has occurred, but that an active gene flow between fragmented populations still exists, maintained by flooding events or pollinators. 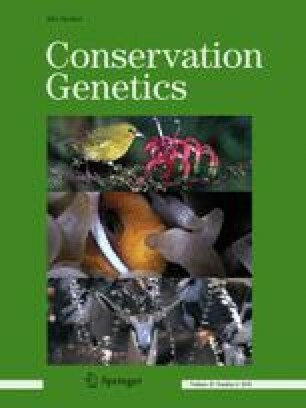 Conservation management actions should improve habitat connectivity, especially for pollinators that vehicle upstream gene flow. Moreover, the west–east structure due to the lithological composition of the gravel and sand forming the alluvial plain of the Po river, should be considered when selecting source populations for translocation purposes. The online version of this article ( https://doi.org/10.1007/s10592-018-1057-8) contains supplementary material, which is available to authorized users. This study was funded by University of Milano-Bicocca, University of Pavia, and by the project “CORINAT”, D.G. Agricoltura, Regione Lombardia.